Stylish and functional, our modern orangeries will provide you with an all year-round space which won’t fail to give you that ‘wow’ factor. Our luxury orangeries are designed to complement your existing building, giving you a design which will not look out of place. Our experienced team of home improvement professionals build orangeries to the highest possible standards. Throughout our years in the industry we have developed close relationships with leading manufactures, ensuring we can offer the most competitive prices for an outstanding product. Further to this, we have committed ourselves to gaining respectable accreditations. Highlighting us as a trusted, leading name in home improvements in Great Dunmow and the surrounding Essex areas. Orangeries provide you with the ultimate flexible living space. Adding an orangery onto your home will immediately give you the light and space you require. A sort of hybrid extension, the middle ground between a glazed extension and a conservatory, orangeries are by far one of the most luxurious and desirable home improvement options available today. They offer the ideal combination of the benefits of a conventional extension and the looks of a conservatory. Their lantern roofs provide an architectural touch and their glazed windows and doors can be made in any size you require. A typical orangery build has stunning glass windows with a lantern style roof. They are extremely practical and can bring lots of value as a kitchen, dining room or bedroom. An orangery can be used for lots of purposes and brings the added benefit of stunning garden views. With more of us looking to create extra space in our homes rather than sell, the orangery offers an affordable alternative to a full brick extension. This substantial extension is suitable for most types of property and has quickly become a luxurious must-have for homeowners. Our experts can help you choose the perfect window and wall proportions for a room that’s tailored to your home and lifestyle. Orangeries offer greater privacy when compared to conservatories. As a seamless continuation of your home, their brickwork provides better insulation and acoustic properties too. Our Orangeries offer a solid wall construction which allows for cavity insulation. This provides you with all year round comfort whilst also providing enhanced light from an open glass roof. 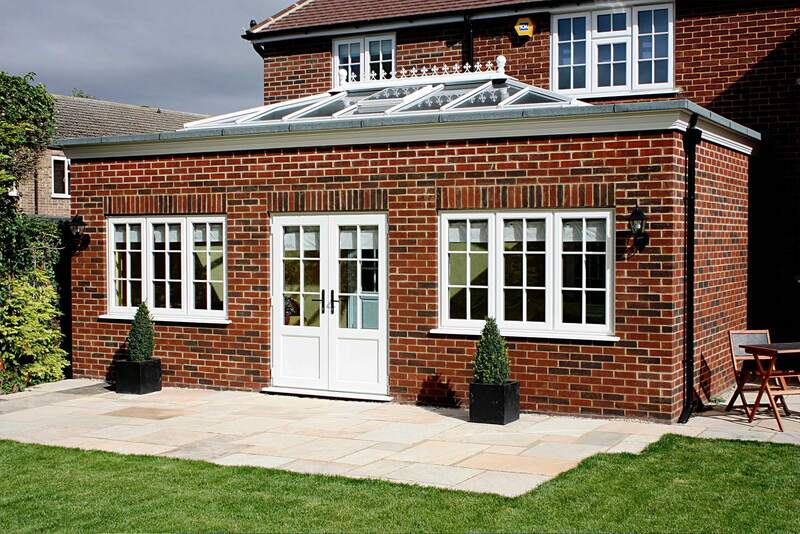 Our tailor-made orangeries can be specified in a choice of windows, doors and glazing. Our beautiful orangeries are a great way of adding light and space to your home without compromising on privacy or efficiency. An orangery can help you make the most of your garden too. Bi-folding doors can be installed so that when open, you can have a seamless connection to the outside. Imagine opening a set of beautiful bi-folding doors on a summer evening, enjoying some al fresco dining. An orangery offers the perfect space for an elegant dining room. If your property is South facing, then you can greatly benefit from an orangery. Compared to a conservatory which is mostly glass, an orangery gives you ample protection from sunlight. If you want the light and airy feel of a conservatory but also need the practicalities of an extension, then an orangery is the perfect choice. Energy efficient, they can be used all year round thanks to their insulating materials. We provide an orangery installation services in Great Dunmow and surrounding areas. We cover Braintree, Chelmsford, Saffron Walden, Bishops Stortford, Stanstead, Thaxted, Harlow, Whitam, Billericay, Brentwood, Basildon and surrounding areas in Essex. We do offer our orangery services outside of these areas, depending on the requirements of the work. To find out if we offer our building services in your area, please get in touch with our team. We proudly offer a leading orangery full build, complete with the most competitive prices on the market. If you would like a free, no obligation quote for an orangery. Please get in touch with a member of our team. Get in touch via our contact form, or by calling 01371 821917 / 07809 576227.